The black-clad HD2000 is chunkily stylish with its handgun grip extending out to a barrel of an f1.8 lens. All the controls are located at the rear and proffer switches and buttons for all your handling needs including operation of the 16x optical zoom. A stills flash pops up when needed, while an accessory shoe is on hand for attaching an external light or microphone. The important connectors such as HDMI, USB and component video are found on a separate docking station. 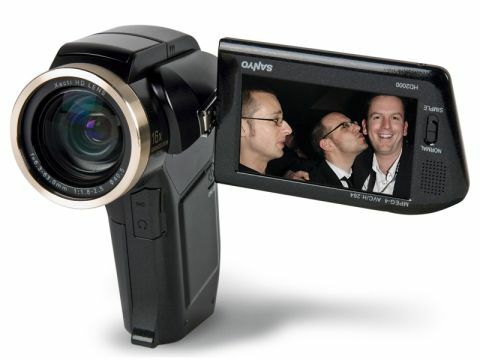 The 16:9 colour LCD screen, as per many of its rivals, is the user's only method of viewing recordings. There's nothing much to distract you beyond those pictures here bar a switch for swapping between Normal and Simple modes, if you don't want to be bothering with its manual overrides. Recordings of both stills and video are made onto a memory card with no alternative on offer. Hi-def pictures offered all the details we've come to expect with colours looking natural, if slightly light at times. The auto functions are first class with exposure and focus working fast and accurately. The onboard microphone recorded stereo well, but was a bit thin on bass. Still images were admirably detailed and sharp as demonstrated by the realistic skin tones and crow's feet recorded . The HD2000 is aimed at the casual user, and its easy operation and good HD pictures should keep those on a budget happy.